India are on the cusp of losing the series 1-4 to England and it is just a matter of time that they will complete the rout. However, the day was highlighted by Alastair Cook’s retirement from international cricket and how big a scar it will leave for England cricket when they will don whites again. What will we do without you, Chef? Despite all the talk surrounding Cook's departure, sports have never stopped because of the retirement of any sportsman and the rule will continue for eternity. There has been a Virat Kohli to satiate Sachin Tendulkar fans, there was a Tendulkar for any fans missing Sunil Gavaskar. A Jimmy Anderson was there to replace a certain Glenn McGrath in public memory, and time will replace Alastair Cook. But with his retirement, a glorious chapter in English cricket has come to an end. No longer will he take the guard with that familiar politeness and leave the ball with absolute audacity. No longer will England have him to score like a master and then they will realise what a player he was for them! At a time, when they took an entirety of six years to find a replacement for Andrew Strauss and still failed at the pursuit, it will be a double whammy for English cricket. Sure, Rory Burns is scoring a lot of runs in County Championship, but when Keaton Jennings is your best bet, I rest my case. After England's tour to India at the end of 2016 with a finger injury, Haseeb Hameed averaged just 19.52 in first-class cricket in the subsequent couple of seasons without a single century and now even failed to make it to the Lancashire side. Players like Nick Gubbins, Ben Duckett, Mark Stoneman, Joe Denly, Alex Hales, Jason Roy, and Daryl Mitchell have been proved to be mediocre in domestic cricket. 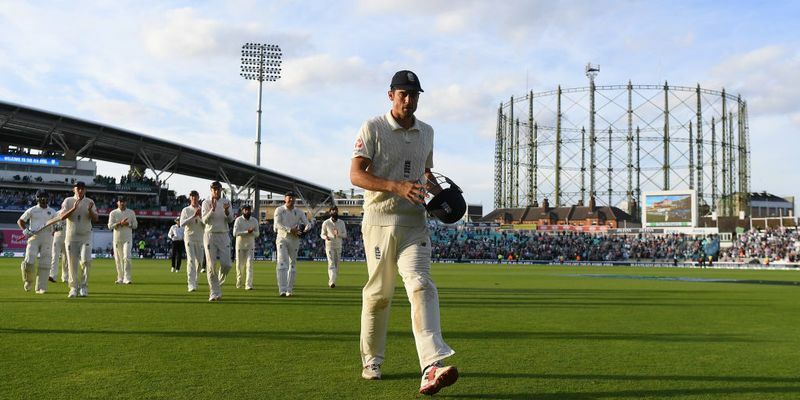 And when Cook played his one final innings for England, it was a stark reminder that things were not going to be the same for Englishmen in the near future. A brilliant 86 and a fine bowling display in the first innings. Ravindra Jadeja would go back home with the satisfaction of releasing the monkey off the back with elan. He knew that to earn the trust of his captain and coach, he needs to turn in a good performance and what a first innings he had! But, somehow, he failed to replicate the same in the second innings with the ball and despite picking another three wickets in the second innings, he was not at his best. Jadeja is a bowler who loves to bowl quicker through the air and he is a master of exploiting the rough areas better than anyone else. In the first innings, he did exactly that and kept on hitting those areas more often than not. He was diligent in his approach and invited the batsmen to come forward to counter his bouncing deliveries. Considering it was creating a different angle, the batsmen were either beaten on the fuller side or were rapped on the pads. However, Jadeja experimented way too much in the second innings and reduced his speed significantly. Instead of asking the batsmen to lunge forward, he maintained the defensive line. There was flight, but it was not backed up by an inward angle from the release point - a tactic that could have given him more success in the second essay. Kohli restores the bragging rights against Anderson. Scores settled or were it? It was the recurring theme on which the Test series was built up. No inch given and none taken. James Anderson and Virat Kohli - two fine cricketers - were set to resume the rivalry. But as Stuart Broad got Kohli out in India’s last innings of the tour, the duel came to an end with Kohli being the winner for not giving his wicket to Anderson even once in 10 innings. But, that doesn’t tell the full story. Full marks to Kohli for not giving his wicket to Anderson despite struggling the most against him. The Indian skipper played 48 false shots against the English spearhead this series, none of them bringing a wicket. Only once in the last 20 years, a bowler drew more false shots from someone in a series without dismissing them and it was Harbhajan Singh bowling to Hashim Amla, in 2010. At the heart of Kohli’s survival was the suppression of his egos and reducing the number of cover drive attempts although from his dismissal in the last innings, it seemed like he hasn’t learned a thing or two from his past mistakes. But, he did a job as a master and survived the danger like a pro. Box ticked - maybe not bas a captain, but as a batsman for sure.